Residents and business owners in Beatty will soon be put in information hyperdrive. Special to the Pahrump Valley Times Lightning fast fiber-optic communications will soon come to remote areas of Nevada, thanks to a partnership between Switch, Valley Communications Association and Churchill County Communications. Valley Communications Association is hosting a ribbon-cutting ceremony, recognizing the town of Beatty being on course as the first all fiber-optic community for high-speed internet in Nevada on Friday. The association will be joined by keynote-speaker Gov. Brian Sandoval, executives from Valley Electric Association, Nye County School District Superintendent Dale Norton and others at the Beatty High School at 1 Hornet Ave. from 11 a.m. to 1 p.m., the association announced in a news release. The event is not open to the public, as it’s being held at the school, a spokesperson from VEA said in an email. A partnership between Switch Communications, a large-scale data storage company that has centers in Northern and Southern Nevada, Valley Communications and Churchill County Communications in Fallon is the backbone of what’s happening in the town of roughly more than 1,000 people. In 2012, construction began on a long tract of high-speed communications foundation between Reno and Las Vegas, with more than 450 miles passing through rural western Nevada. 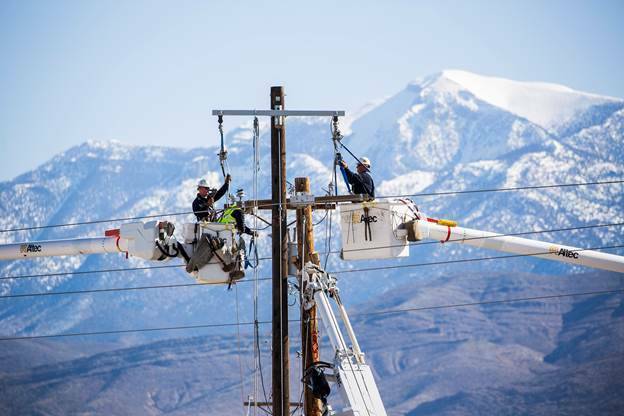 The collaboration allowed for buildout of high-speed communications to several rural communities across the state: Beatty, Amargosa Valley, Yerington, Hawthorne and others. Maintenance on the several hundred miles of lines, that mostly parallels U.S. Highway 95, is shared between the two utility companies. Valley Communications is pegged to cover Nye County from Tonopah to Las Vegas; meanwhile, Churchill County Communications is covering Churchill County from Tonopah to Reno. Valley Electric began rolling out its high-speed broadband to its 6,800-square-mile service territory in 2015, which piggybacked an existing fiber-optic network it had installed a few years earlier to manage its electric grid, the group said in a news release in March. The rollout in Beatty, along with other rural areas, is expected to help business, schools, residents and hospitals improve their level of communications. Norton, in a news release from Valley Communications, noted how it would help local classrooms. Churchill County Communications began its fiber-to-home buildout in 2008 and turned up its first-gigabit customer in 2015. This partnership allows the group to expand on those offerings.